1 Intel measurements. Up to 71% performance increase of Intel Xeon Platinum vs. previous generation E5 v4 average performance based on key industry-standard benchmark calculations comparing 2-socket Intel Xeon Platinum 8180 to E5-2699 v4 family processors. Any difference in system hardware or software design or configuration may affect actual performance. May 2017. 2 Up to 27% performance increase of Intel Xeon Platinum vs. previous generation comparing 2-socket Intel Xeon Platinum 8180 (28 cores) to E5-2699 v4 (22 cores). Calculation 28 cores/22 cores= 1.27 = 27%. May 2017. 3 2933 MT/s DDR4 DIMMs are supported with the 2nd generation of Intel Scalable Processors; while 2600 MT/s DDR4 DIMMs are supported with the 1st generation of Intel Scalable Processors. 4 The Gen10 2666 MT/s memory speed is 11% faster than that of Gen9 2400 MT/s, enabling faster server performance. 5 Up to 16% performance increase of Intel Xeon Platinum versus previous generation comparing 2-socket Intel Xeon Platinum 8180 (28 cores) to Intel Xeon Platinum 8280 (28 cores) measured by SPECrate®2017_fp_base. SPEC and the benchmark names SPECrate are registered Trademarks of the Standard Performance Evaluation Corporation (SPEC). All rights reserved; see spec.org. April 2019. 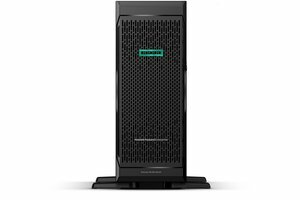 HPE ProLiant ML350 Gen10 Server delivers expandability with a wide range of drive upgrade options. Supporting 8 to 24 SFF or 16 SFF when mixed with optional 8 NVMe PCIe solid state drives, 4 to 12 LFF hot plug or non-hot plug drive options protecting your IT investment in hybrid environment. HPE ProLiant ML350 Gen10 Server is one of the HPE industry standard servers with major firmware anchored directly into the silicon security protection built in across the server lifecycle starting with Silicon Root of Trust.